This gap-toothed tower is a familiar landmark on the road to Hoveton. The tower was obviously completed right on the eve of the Reformation, because Pevsner points to a bequest of 1498 for its Reparation. In 1838, the enthusiasm for renewal in the Church of England was just beginning, fuelled by the ideas of the Oxford Movement and Government-funded attempts to combat the influence of non-conformism and Catholicism in urban areas. The Norwich Diocese took the opportunity to rebuild several parish churches nearer to the centre of population, and All Saints at Hainford was one of them. Diocesan architect John Brown designed a handsome cruciform church in knapped flint and red brick, which went up about half a mile away in the centre of the village. Intriguingly, the old church did not fall completely into disuse. We came here on a bright day in Autumn, one of those days when its hard to believe that just a few short weeks separated us from heavy frosts and even snow, and as we picked our way through the Victorian headstones swathed in long grass, we noticed that a 19th Century chapel had been built onto the eastern face of the tower. Curiously, this post-dates the building of the new church. The old nave and chancel must have been demolished, and this structure put up in its place. The reason for it became obvious after a moment's thought. After the old church was abandoned, its graveyard remained in use, and does so to this day. What we were looking at was obviously a Victorian mortuary chapel, a place where the coffin could rest and the funeral be celebrated on site, without need for the deceased to be brought from the new church for burial. Today, the chapel is also in ruins, and the entire structure is surrounded by high chain link fencing to keep people out, misspelt signs driving the point home. However, Norfolk County Council is currently undertaking a programme of restoring ruined churches, and I hope this one will come to their attention. 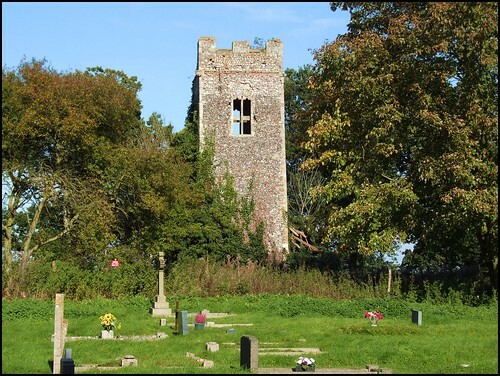 It is a handsome tower, with grim little gargoyles facing out across the Norfolk countryside, and the whole site, with its boiling trees and well-preserved inscriptions, is one worth keeping.